Relaxing in a sauna is a fantastic experience, with many health benefits. It’s an excellent way to rejuvenate your body and clear your mind. 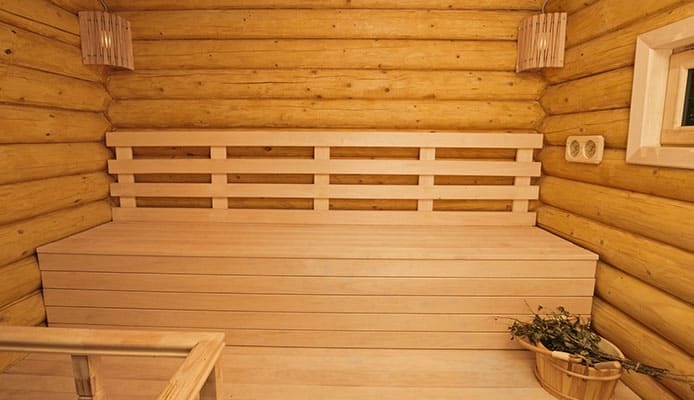 To make your stay in the sauna pleasant, the temperature needs to be just right. If it’s too hot, you will feel uncomfortable and even find yourself in a potentially dangerous situation. For this reason, it’s smart to have a thermometer inside your sauna. These are not your ordinary thermometers – they are designed to withstand the conditions inside a sauna and accurately give you information, so you know when it’s time to make adjustments or to get out. Not all products are the same, and some even come with additional features. The best sauna thermometer is well-made, reliable, accurate and long-lasting. We reviewed eight of these for you, and also compiled a buying guide so you have an easier job when selecting a product. Here we have a really stylish thermometer, made of cedar wood. It’s a very popular product, and for many good reasons. The build quality is excellent, which guarantees durability. If you encounter any problems, you can reach customer service any time. It shows temperature in both Celsius and Fahrenheit, making it very versatile too. Finally, it’s not very large. Shaped like a square, it measures 5 ½ x 5 ½ inches, meaning you will see it easily but it won’t take too much space. This is a really well made product, which has much to do with the combination of materials used. It has a wooden body with a stainless steel plate and gauges over it. 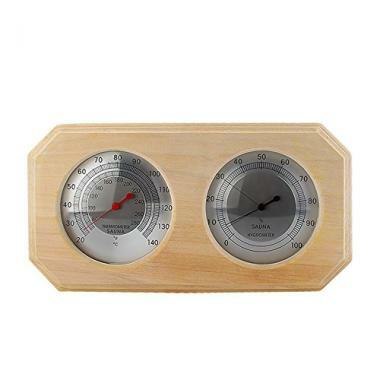 It shows both temperature and humidity, and there are separate dials for easier reading. Furthermore, it displays temperature in both Fahrenheit (70-280°F) and Celsius (20-140°C). As for humidity, it measures from 0 to 100 percent, and with good accuracy too. The dials are 4.5” in diameter, which is a bit smaller than average. They are still pretty easy to see, especially given that the temperature needle is colored brightly red. It’s one of the most versatile products in our sauna thermometer reviews and definitely worth giving a try. 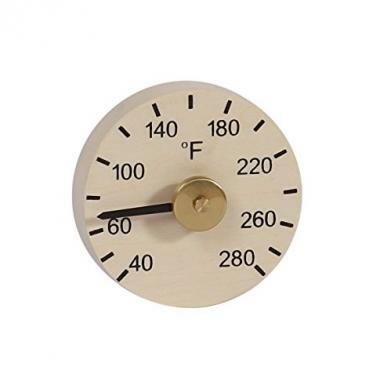 This is one of the most simplistic thermometers you will be able to find. Measuring just above 3 inches in diameter, it has a wooden body and easy to see needle and numerals. It shows temperature in Fahrenheit only, ranging from 40 to 280 degrees. The fact that it doesn’t have a glass lens means there will be no glare which sometimes prevents reading the temperature. The manufacturer guarantees your satisfaction, and their customer service is always at your disposal. In addition, this product is friendly towards your wallet too. We begin with a two-in-one product from Eleoption, with separate gauges for temperature and humidity. It shows temperature in both Celsius and Fahrenheit, and can measure humidity up to 100 percent. You get a handcrafted product made of high-quality pine with a glass lens and easy to see numerals. It’s very precise too, and comes at a great price. When all is put together, this is possibly the best thermometer for saunas in terms of value for money. Fischer is a manufacturer well-known for the quality of their products. 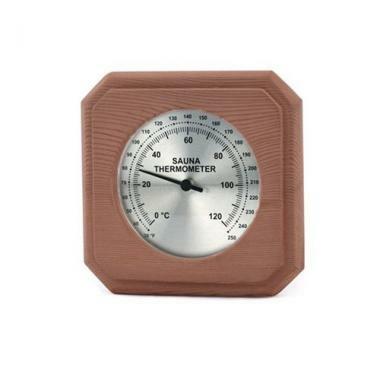 With a body made of stainless steel, this top rated thermometer for sauna will last for years. This is a US version, meaning it shows temperature in Fahrenheit, ranging from 90 to 250 degrees. In addition, it measures humidity too, from 0 to 60 percent. It has a round shape, with a diameter of 6.3 inches almost completely filled out by a nicely designed dial. 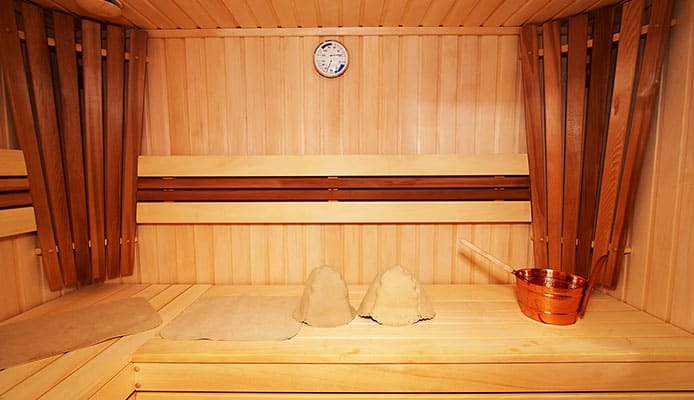 It works well in any type of sauna – you can even use it in a portable sauna if you own one. The manufacturer gives you a two year warranty, meaning you can have peace of mind. Truth be told, it is more expensive than many others, but knowing you’ll be getting one of the best sauna thermometers out there makes it worth every penny. Here we have another high-quality thermometer, but for a more affordable price. It measures 5 inches in diameter and it’s made of stainless steel. 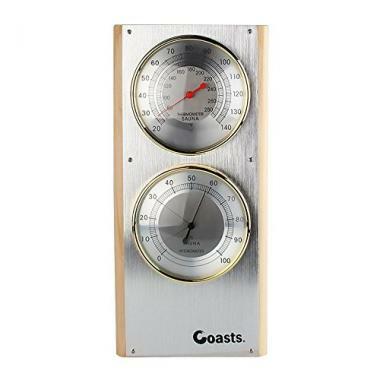 The temperature is shown in Celsius, and it also has a hygrometer which measures humidity from 0 to 100 percent. The dial is clear and very easy to see. It’s a very accurate product, which even allows you to easily calibrate it if there’s need. Finally, it looks great too. This is the second Fischer product on our list, this time with a different design. It’s hand crafted, with a high-quality frame made of wood. As you can see, it’s square-shaped, with 6.7-inch sides. This guarantees great visibility no matter where you put the sauna temperature gauge. It measures both temperature and humidity which is a plus. It operates accurately and records changes quickly. Bottom line, it’s a high quality product which will work without trouble for years. This is a round, 6.1-inch thermometer, once again from Fischer. The gauge shows temperature on the lower part, while the upper part has a separate needle which shows humidity. The dial is designed very well, with large numerals and even marked zones for ideal sauna temperature and humidity. The frame is made of light apache wood and looks beautiful. It’s hand-crafted, and you get a two-year warranty with your purchase. You should be able to rely on your thermometer that it will work correctly no matter the conditions inside the sauna. You want to avoid potential health hazards, and there’s no use having a thermometer which won’t do the measurements properly. This and several other factors are significant when talking about a good thermometer. The whole point of having a thermometer inside your home sauna is that you can get the information quickly. This means that you can see it clearly from a distance, without needing to move or stand up. The dial should be designed in such a way that the numerals are large and easily recognizable. Of course, the gauge needle should be easy to see too. 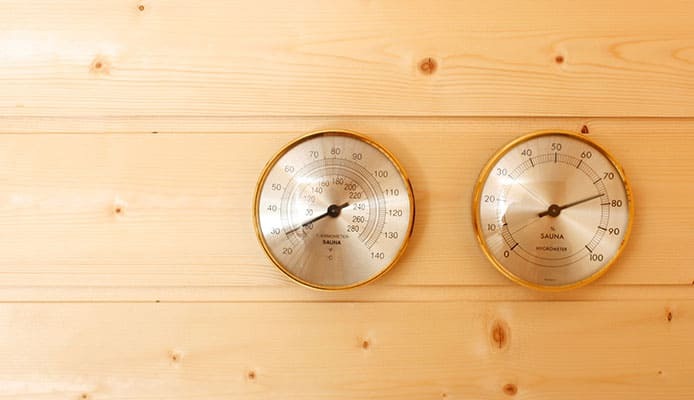 In addition, sauna thermometers show temperature in degrees Fahrenheit, Celsius or both. Be sure to check this when buying – it’s annoying when you have to convert units all the time. You will also find some differences in temperature range, where some products measure higher temperatures compared to others. You don’t have to pay special attention to this, since these temperatures are very unlikely to be reached in your sauna anyway. Your new thermometer should be resistant to continuous exposure to high temperatures and moisture in a sauna. You don’t want to be wasting money on something that will get damaged after a few days of use, and then show wrong information or stop working altogether. It should be moisture proof too, so it doesn’t fog up inside and prevent you from reading it. This way you can use your thermometer no matter if you have an infrared sauna or more traditional dry or steam sauna. Two main types of thermometers are available – analog and digital. While many digital thermometers are excellent, we discussed only analog products in this article. They are often more suited for sauna use and show greater durability and precision. No matter which type you choose, make sure you pick a product which allows you to kick back and enjoy the sauna health benefits without worrying if it’s going to break or not. As you had the chance to see in the review section, some products come as a 2-in-1 package. In addition to a thermometer, they also measure air humidity. This is very useful, since different temperature and humidity levels can give you a different experience. 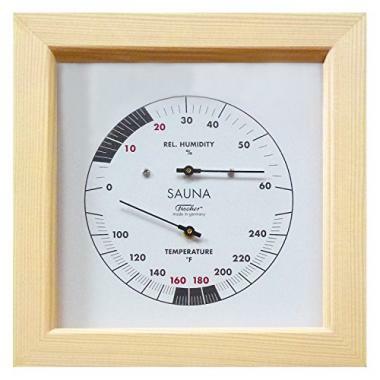 A sauna hygrometer is placed in the same frame as the thermometer. 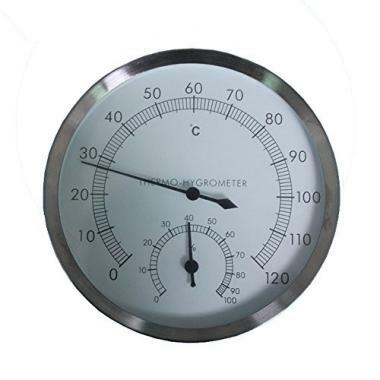 Some products have two separate gauges, while others have a single dial with separate needles for temperature and humidity. 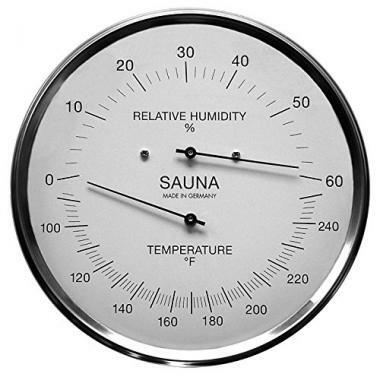 Like we mentioned, readability is very important when it comes to sauna thermometers. This is where the size comes in, which is logical – the larger the product, the easier it is to read the information off it. Most product we talked about are around 6 inches in diameter, which is optimal. This way they aren’t too large, but you can still see them on the opposite wall for example. Think about this and the size of your sauna, so you get an appropriate product. Choice of materials is very important. This is why manufacturers use materials which are resilient to sauna conditions – stainless steel or high-quality wood (cedar or spruce for example). Unlike pool thermometers, plastic is not desirable to have in your sauna thermometer, because it can get deformed after a while. The same goes for the lens (if your product has one). It should be made of glass, so you can be sure everything stays in place instead of getting loose after some time. Thermometers are very straightforward products, and they will work right out of the box. They don’t require any special installation – you can put them on the bench or hang them on the wall. It’s smart to think about proper placement though, as well discuss a bit later. Be sure to read the instructions which came with your product, so you can get most out of it. Q: Why Use A Sauna Thermometer? A: A sauna thermometer is a great addition to keep your stay inside the sauna safe and comfy. This is especially important if you have a cardiovascular disease for example – temperatures which are too high can seriously put your health at risk. Healthy people are at risk too – you can dehydrate after a long stay, or get burns on your skin. There are more things to be considered here compared to standard spa and hot tub safety, so getting a thermometer allows you to know when to adjust the temperature and when it’s time to leave. Q: What Is The Best Place To Hang The Thermometer? A: The best position is the one which will give you the most accurate reading. It should be at the level of your head, so neither too close to the ceiling (hot air rises), neither near the floor (air is colder). Also, try to put it away from the door because it can cool down when someone opens it. Finally, don’t put it too close to the heat source either, since you can get higher readings. Q: How Easy Is to Use a Thermometer? A: Using a sauna thermometer is incredibly easy. Just place it where you wan’t it, and it will start working and show the temperature quickly. Much like outdoor thermometers, you can use it immediately. If you get a product which has a hygrometer too, you will sometimes need to calibrate it so it shows accurate info. This isn’t hard to do, just follow the steps in the manual. A sauna thermometer is a product which is more than useful to have in every sauna. In addition, it’s very inexpensive so you should really try it out. Even if you have top of the line sauna with a control panel which shows temperature, it’s usually located on the outside so it’s not very practical to go out and check. We hope our list and buying guide helped you find the best thermometer for sauna, and made your choice easier. Enjoy and stay safe! 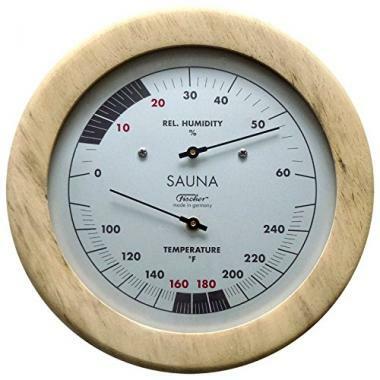 Have you tried sauna thermometer that made it onto our list? Are you satisfied with the quality? Are the readings accurate? Please share your experience with us in the comment section below.